QC Industries HydroClean HC200 Conveyors encompass a sanitary design for handling all types of applications including food products, medical devices, pharmaceutical and clean room industries, and wet and washdown environments. 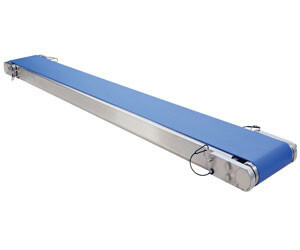 The HC200 conveyors offer a variety of options to fit the user’s unique application. The stainless steel conveyors are purpose built for easy cleaning. Every conveyor can be disassembled without tools to simplify the cleaning protocol. The design ensures opportunities for bacteria to accumulate are minimised. The systems comprise sealed ball bearings, hex head fasteners, slotted frames and soft angles to promote drainage. The unique tension release technology operates at the pull of a pin to relieve tension on the belt. Cleaning under the belt is quick and easy, with no tension or tracking adjustments required. Belt changes are simple and tool-less. 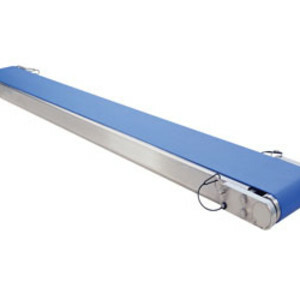 Suitable antimicrobial totally encapsulated and plastic chain belting options are available. All HC200 include crowned pulleys and V-guided belts for positive tracking, especially in wet environments. The systems operate at speeds of up to 1.5 m/s with loads up to 54 kg. Their 60 mm profile will fit in space-limited applications. The conveyors are offered with accessories to complement the product and complete the user’s design requirements. These include stands, mounts, side and guides, drive packages and washdown gearmotors. The HC200 conveyors feature a 10-year warranty. I am interested in HydroClean HC200 Conveyors .